We often get questions from people wondering why their site isn’t ranking, or why it isn’t indexed by the search engines. Recently, I’ve come across several sites with major errors that could be easily fixed, if only the owners knew to look. While some SEO mistakes are quite complex, here are a few of the often overlooked “head slamming” errors. So check out these SEO blunders — and how you can avoid making them yourself. The robots.txt file has a lot of power. It instructs search engine bots what to exclude from their indexes. In the past, I’ve seen sites forget to remove one single line of code from that file after a site redesign, and sink their entire site in the search results. So when a flower site highlighted a problem, I started with one of the first checks I always do on a site — look at the robots.txt file. I wanted to know whether the site’s robots.txt was blocking the search engines from indexing their content. But instead of the expected text file, I saw a page offering to deliver flowers to Robots.Txt. The site had no robots.txt, which is the first thing a bot looks for when crawling a site. That was their first mistake. But to take that file as a destination … really? Secondly, the site was automatically generating nonsense content. It would probably deliver to Santa Claus or whatever text I put in the URL. I ran a Check Server Page tool to see what status the autogenerated page was showing. If it was a 404 (not found), then bots would ignore the page as they should. However, the page’s server header gave a 200 (OK) status. As a result, the fake pages were giving the search engines a green light to be indexed. Search engines want to see unique and meaningful content per page. So indexing these non-pages could hurt their SEO. Next, I checked to see what the search engines thought of this site. Could they crawl and index the pages? Looking at the source code of various pages, I noticed another major error. In other words, search engines were being told that every page was actually a copy of the homepage. Based on this tag, the bots should ignore the rest of the pages on that domain. Fortunately, Google is smart enough to figure out when these tags are likely used in error. So it was still indexing some of the site’s pages. But that universal canonical request was not helping the site’s SEO. Have a valid robots.txt file to tell search engines how to crawl and index the site. Even if it’s a blank file, it should exist at the root of your domain. Generate a proper canonical link element for each page. And don’t point away from a page you want indexed. 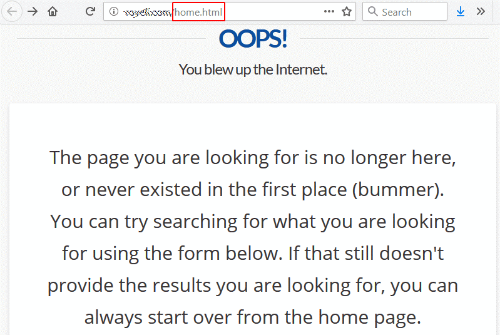 Display a custom 404 page when a page URL doesn’t exist. Make sure it returns a 404 server code to give the search engines a clear message. Be careful with autogenerated pages. Avoid producing nonsense or duplicate pages for search engines and users. Even if you’re not experiencing a site problem, these are good points to review periodically, just to be on the safe side. Oh, and never put a canonical tag on your 404 page, especially pointing to your homepage … just don’t. Sometimes a simple change can be a costly mistake. This story comes from an experience with one of our SEO clients. When the .org extension of their domain name became available, they scooped it up. So far, so good. But their next move led to disaster. They immediately set up a 301 redirect pointing the newly acquired .org to their main .com website. Their reasoning made sense — to capture wayward visitors who might type in the wrong extension. But the next day, they called us, frantic. Their site traffic was nonexistent. They had no idea why. A few quick checks revealed that their search rankings had disappeared from Google overnight. It didn’t take too much Q&A to figure out what had happened. They put the redirect in place without considering the risk. We did some digging and discovered that the .org had a sordid past. The previous owner of the .org site had used it for spam. With the redirect, Google was assigning all of that poison to the company’s main site! It took us only two days to restore the site’s standing in Google. Always research the link profile and history of any domain name you register. A qualified SEO consultant can do this. There are also tools you can run to see what skeletons may be lying in the site’s closet. Whenever I pick up a new domain, I like to let it lie dormant for six months to a year at least before trying to make anything of it. I want the search engines to clearly differentiate my site’s new incarnation from its past life. It’s an extra precaution to protect your investment. Sometimes sites can have a different problem — too many pages in the search index. Search engines sometimes retain pages that are no longer valid. If people land on error pages when they come from the search results, it’s a bad user experience. Some site owners, out of frustration, list the individual URLs in the robots.txt file. They’re hoping that Google will take the hint and stop indexing them. But this approach fails! If Google respects the robots.txt, it won’t crawl those pages. So Google will never see the 404 status and won’t find out that the pages are invalid. The first part of the fix is to not disallow these URLs in robots.txt. You WANT the bots to crawl around and know what URLs should be dropped from the search index. After that, set up a 301 redirect on the old URL. Send the visitor (and search engines) to the closest replacement page on the site. This takes care of your visitors whether they come from search or from a direct link. I followed a link from a university website and was greeted with a 404 (not found) error. This is not uncommon, except that the link was to /home.html — the site’s former homepage URL. At some point, they must have changed their website architecture and deleted the old-style /home.html, losing the redirect in the shuffle. Ironically, their 404 page says you can start over from the homepage, which is what I was trying to reach in the first place. It’s a pretty safe bet that this site would love to have a nice link from a respected university going to their homepage. And accomplishing this is entirely within their control. They don’t even have to contact the linking site. For extra credit, go to Google Search Console and review the Index Coverage Status Report. Look at all of the pages that are reported as returning a 404 error, and work on fixing as many errors here as possible. The site redesign launches, the canonical tags are in place, and the new Google Tag Manager is installed. Yet there are still ranking problems. In fact, one new landing page isn’t showing any visitors in Google Analytics. The development team responds that they’ve done everything by the book and have followed the examples to the letter. They are exactly right. They followed the examples — including leaving in the example code! After copying and pasting, the developers forgot to enter their own target site information. When things don’t work right, look beyond just “is this element in the source code?” It may be that the proper validation codes, account numbers and URLs were never specified in your HTML code. Mistakes happen. People are only human. I hope that these examples will help you avoid similar SEO blunders of your own. But some SEO issues are more complex than you think. If you have indexing problems, then we are here to help. Call us! Our SEO consulting may be just what you need. Like this post? Please subscribe to our blog to have new posts delivered to your inbox. I think every SEO expert must have done these mistakes once in their life and that is that we learn from our mistakes. I’m guilty of a couple of these, good to learn from the mistakes. I always find a lot of opportunity in SEO Fail #6: Missed Link Equity! Especially when working with new SEO clients. The post is great. Really appreciate your efforts that you put in it. Anh: We’re so glad to help! I’ve definitely overlooked some of these issues before and couldn’t find the solution even though it was right before my eye! Thanks for sharing Bruce! Hi there, Great source of information. I think these are some of the crucial factors in SEO as well. Typically done with software, article spinning is the black-hat tactic of trying to recreate quality content using different words, phrases, and organization. Sometimes when we doesn’t implement on-page SEO changes properly, It start to show errors. Great article, Bruce. To add on; a poor internal linking structure is another mistake that one needs to avoid. Thanks for sharing this. Very helpful! these mistakes are very common. mostly we made. thanks for sharing this informative post with us. Yeah we need to avoid this mistakes in order to beat our competitors and one of the most common mistakes is copy paste fail and we have to take appropriate measures to control it. Reorder and neglecting to change your site’s data. You must be occupied in case you’re making these mistakes, lol! Will add a portion of this to our agenda, thank you, Bruce. Useful examples to avoid similar SEO blunders! Yogesh: We’re glad you were able to correct your course in time! Thanks for letting us know. Almost making 2 mistakes and thanks for your article. very very helpful and Informative. Thanks, Bruce for sharing the main problems of SEO. Most of the people face Canonical errors and have no knowledge about how to tackle this kind of problems. You clearly define every SEO problem with their solution. Yeah, that’s true the most common mistake is people do not focus on the Robots.txt file that how to manage it properly. Most of us only focus on off page SEO. I agree with the all the above points. But still we need to review the website everyday to make sure everything is on the place. these are the mistakes everyone should remember while doing seo and after seo. Really these minor fails can lead to unexpected ranking results. One should always keep such micro things in mind while optimizing any website because these are basics but plays an important role in website ranking. I agree with the fact that indexing of non-pages should be revoked for better crawling. I’ll make sure to avoid these fails lol. Thank You for amazing write up. and if they only knew, they wouldn’t have anything really in it. Rishi: Google’s index refers to its database of the internet’s contents, constantly being refreshed, from which it pulls search results. A robots.txt file is a text file that you, as the website owner, put at the root of your website if you want to “disallow” certain pages or directories from being indexed. Search engine bots politely check it each time they crawl your site. i want to know what the difference between google index and robot.text?or if one put link only in google index then it will rank or not? Hi Bruce, we see these type of fails happening all the time. Over at ContentKing we’re running a real-time SEO auditing platform that continuously checks sites for all sorts of issues and changes, including the ones you describe. And I can tell you we catch so many of these very day. It’s interesting that at first everyone thinks “This won’t happen to me”, and then it does. Because Murphy’s law. Very indepth and well researched writeup. I really appricate the efforts put in. Things like Robots.txt basic but really helpful as mistakenly SEOs sometimes miss to check these things. This is good to know that these mistake may happen while doing seo for site and might be its happening with us so need to look at them. Nice sharing bruce!!! Copy and paste and forgetting to change your website’s info. You have to be distracted if you’re making these errors, lol! Will add some of this to our checklist, thank you, Bruce.